For more details on the legislation, click here. For a dissection of the fee split issue, click here. For an editorial by members of Media Council, click here. Student organization leaders and Student Government Association (SGA) legislators voiced mixed opinions at SGA legislative session Monday night, where SGA ultimately passed an amended bill that establishes a new budgeting process for funds coming from the Student Activity Fee. The Student Activity Fee is comprised of the $89 students pay with their tuition each semester and is distributed among the 12 divisional councils – such as College Council and BBA Council, which represent specific Emory schools – and four University-wide organizations: Student Programming Council, Club Sports, Media Council and Outdoor Emory Organization. As a result of the passage of the bill, SGA has eliminated fixed percentages for University-wide organizations under the fee split, effective as early as next fall, and has created a new SGA business office data entry specialist position. Due to the amendment added during Monday’s meeting, SGA will also create a committee to review fee split percentage allocation for future years to protect organizations from drastic funding changes. 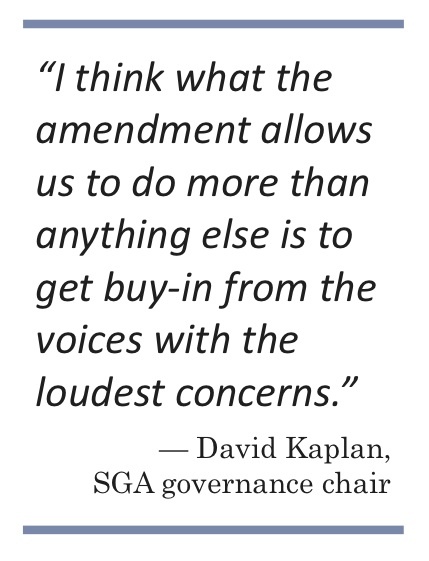 The amended version of the bill – titled “Bill to Revise SGA Fee Split and Institute New SGA Budgeting Process for University-Wide Divisions” and authored by MBA student and SGA Governance Chair David Kaplan – passed by a vote of 18-6-1. The passage of the bill with the amendment means the fee split review committee will form next semester. The committee can make and implement recommendations by fall 2014 at the earliest, Kaplan said at the meeting. Before the bill passed on Monday, SGA would allocate a fixed percentage of money to the University-wide organizations each year. Since the bill has passed, these organizations will receive money on a need-based system that is identical to the process used for other student organizations chartered under SGA. Meanwhile, the new data entry specialist position will be funded by taking 1 percent of the budgets of each of the divisional councils. Several Emory students, including many student organization leaders, filled the Faculty Dining Room in the Dobbs University Center (DUC) Monday night to express concerns about the bill, bringing opposition to both the proposed fee split decreases and increase in SGA oversight as well as the seemingly rushed timing of the bill. 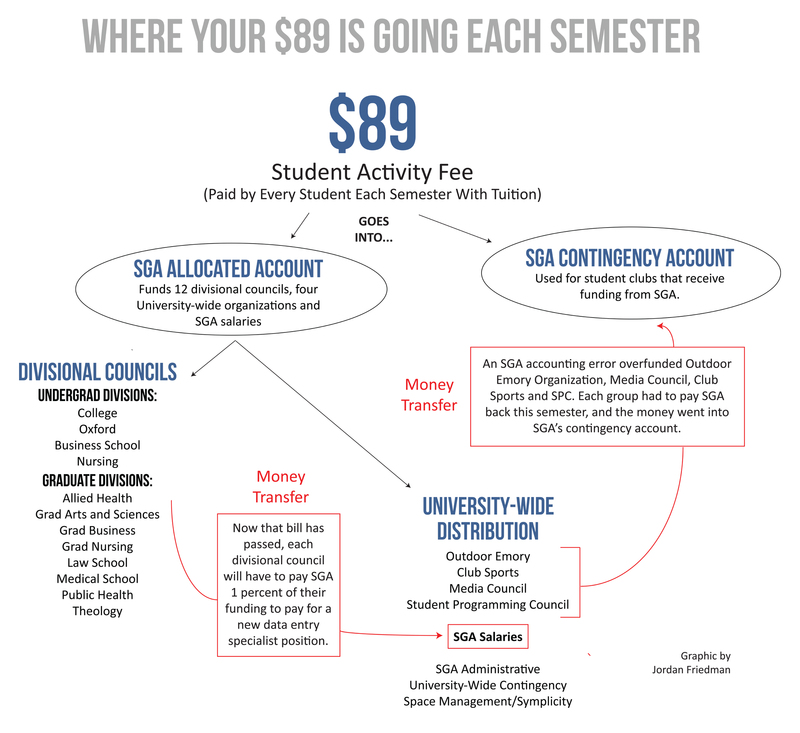 However, SGA Vice President of Communications and College sophomore Jon Darby said any changes in the fee split needed to be passed by Monday’s meeting – the last SGA meeting of the semester – in order to take effect for the next academic year. Changes like these must be incorporated into the University financial and budgeting allocation process, which takes place in the spring. This heightened the sense of urgency among both legislators and students. College sophomore and SGA Sophomore Representative Ami Fields-Meyer and College sophomore and SGA Representative-At-Large Raj Tilwa proposed an amendment to keep the portion of the bill dealing with the data entry specialist, but table the conversation about the fee-split changes until more debate could take place. But some legislators expressed reservations with waiting that long to implement fee split changes. The amendment, which ultimately failed by a vote of 6-16-3, would not have allowed changes to the monetary code until the 2014-2015 academic year, an entire year later than the timeframe proposed by the original bill. 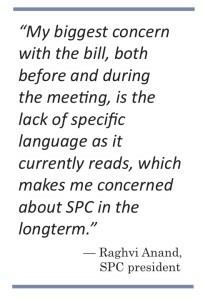 SGA President and College senior Raj Patel, who also co-authored the bill, expressed his support for the bill as a shift away from retroactive oversight to stop wasteful spending. BBA Council President and Goizueta Business School senior Patrick McBride said he felt as though the conversation of those in attendance fell on deaf ears. Laney Graduate School Representative Laura Mariani pointed out during the debate that the Graduate School Council has a budgeting process virtually identical to the one proposed to the bill. She said that it worked effectively for them. Kaplan said he is satisfied with both the comments made at the meeting and the status of the bill. “The spirit of the bill is unchanged, the purpose of the bill is unchanged and the details of the bill will be stronger,” Kaplan said. Leaders of University-wide organizations in addition to Farina – who co-authored a Wheel editorial on the subject – have reacted with some concerns. Outdoor Emory Organization Treasurer and College sophomore Alex Ting said he is worried about the new fee split bill’s effect on the organization. News Co-Editor Dustin Slade contributed reporting. Correction (12/12 at 10:40 p.m.): The quote “SGA is trying to protect University-wide organizations by ensuring they will have funding for their chartered clubs,” was misattributed to James Crowe. It was David Kaplan who made the statement.